This work was written by the artist in the last year of his life, when the seizures of mental illness alternated with periods of tranquility. While on treatment at Saint-Remy Hospital, Van Gogh often painted local landscapes. “The road with the cypress and the star” became one of the last paintings written by him in the hospital. The artist himself was very fond of this work, which reminded him of the south. This picture is made in a style that finally formed in Van Gogh at the end of life. Curling brushstrokes are laid with a thick pasty layer. Their dynamic vortexes form the objects of the landscape, the forms of which balance on the verge between fantasy and reality. A dense dark blue sky is adorned by a star, the dimensions of which almost exceed the size of a thin month with a red border. The dance of long strokes forms a fairy halo around it. In the center of the composition is a huge straight cypress. It is so high that the author does not seem to have enough of the canvas to place it on the picture completely. His sharp dark leaves haphazardly sprawl, as if trying to escape to the night sky. A wide winding road runs past him, written with dynamic strokes of different colors. Walking away to a small hotel with lighted windows, it looks oblique, unsteady and unstable, and two disproportionately small figures seem to slip off of it, tending beyond the canvas. All this gives the night motive a shade of nervousness and anxiety. 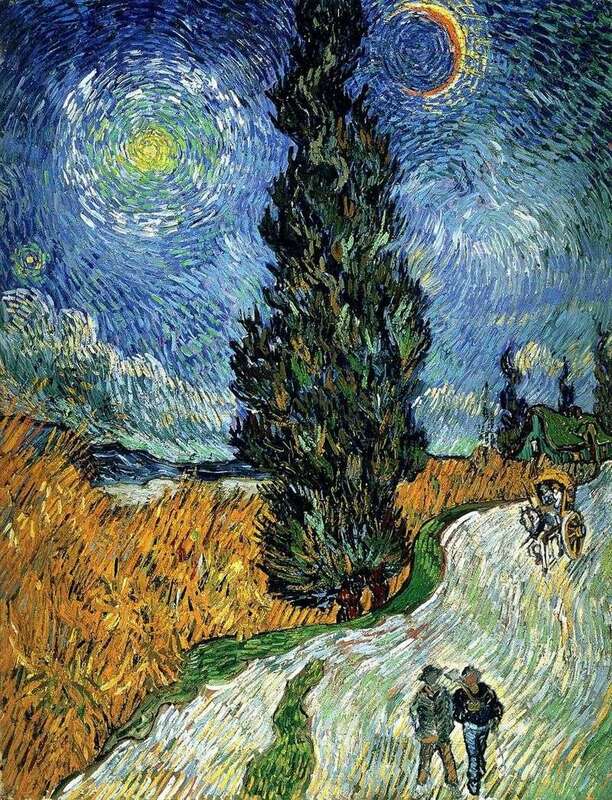 Description and meaning of the painting Road with cypress and star by Vincent Van Gogh.